I was taller than most other kids and had some baby fat. My parents panicked and began putting me on diets and that set up a lifelong poor relationship with food. I was either depriving myself and forcing myself to not be interested in food or I was wildly out of control with it. My weight and the way I was treated because of it had a direct impact on my self-esteem. My self-image was stunted from an early age and never really had a proper environment to flourish. I was called names, taunted, and ostracized because of my size, and I led a very isolated life at school because of it. Life was painful growing up. After losing and regaining 100 pounds on two occasions, I was worn out and just decided to accept the fact that I’ll always be heavy. I’d tried so many food plans and methods, my conclusion was there wasn’t a way out. So one day, not long after officially giving up on ever getting the weight off, I saw Carnie Wilson on the Oprah show looking thin and happy. When she said the name of her fitness mentor, I Googled it and found Dallas Page and DDPYOGA, a form of cardio yoga. Seeing Carnie like that gave me hope because we were both chubby kids who became obese adults. I knew in my gut there might be a way out afterall. I began doing DDPYOGA, and working on my food intake in gentle ways that did not feel like a diet. I knew that would only set me up for failure. My first goal was to just stop binge-eating. Instead, I ate when I was hungry and stopped when I’d had enough, but wasn’t stuffed. I also became more aware of my food choices. I knew I could no longer live on junk food and expect weight loss results, so I added more whole foods, fruits, vegetables, eggs, lentils, and of course, the occasional treats. I refused to play the ‘never again’ game. No one ever got obese from eating their favorite dessert or meal every now and then. So when I wanted fried chicken, really wanted it, I ate it with enjoyment and no guilt. The other difference: I eat fried chicken with a side of green vegetables and not biscuits and mashed potatoes. It works! Immediately! I lost 20 pounds the first month, just from ceasing and desisting with the binge-eating. I used to eat myself into a stupor most evenings after work: cheeseburgers, pizza, Italian bread soaked in butter, potato chips and dip, etc. Just from cutting those damaging things out and eating more wholesome meals my body did the happy dance. In the beginning, I was hungry at night after dinner a lot. My body was so accustomed to large quantities of food that it was a learning curve at first. I was so thrilled with the results of the first month that I wanted to keep the momentum going. And the most exciting part: I wasn’t dieting! Just finding sane and rational ways to deal with food that I could live with long-term. Because a live-able plan was unfolding and I knew I was eating well during the day, I was willing to live with a little stomach-rumbling at night. I can’t say I ever wanted to give up. 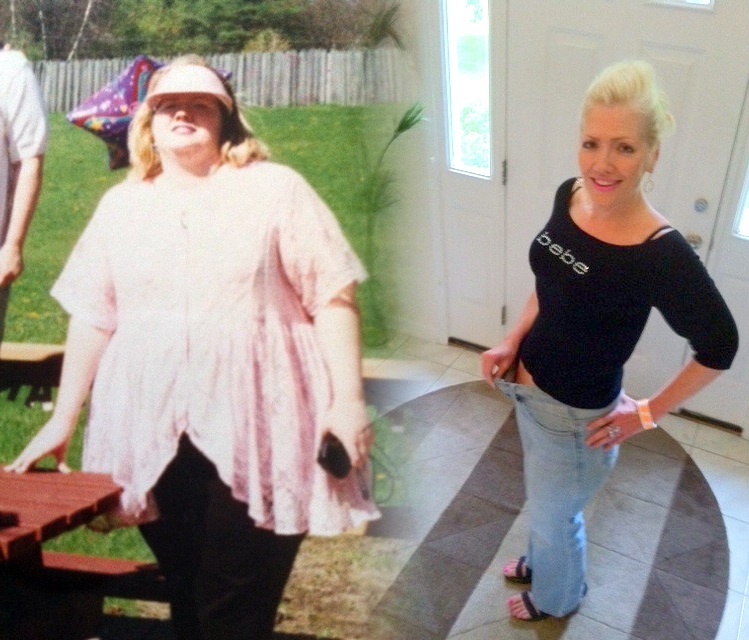 I loved my new way of eating and living…and the results that came with it. Of course, life always has its share of challenges and tough moments. I still wrestle with times I feel drawn to comfort myself with food. When that happens, I know there’s something that’s upsetting or stressing me that needs attention, it’s actually a useful warning that I need to take a closer look at what’s going on. I didn’t and that’s possibly because I didn’t diet or do anything too strict. There was no timetable for me either as far as the weight loss went. Too many times in the past I tried to intervene and micro-manage the weight loss and it never worked. I realized this time around my body, the same instrument that regulates my blood pressure, metabolism, and heartbeat is smart enough to handle this on its own. I’m letting it be in charge. I’m so glad I did this because it took pressure off me and just allowed the good habits I was forming to become permanent. About 18 months. I didn’t care how fast the weight came off, only that the changes I was making feel like ones I can live with, and they do. I’ve kept the weight off for nearly 5 years. All the time! And they’re the best. One of my first NSV’s was going to a spa and being able to wear their robes! In the past I’d always have to bring my own 4X robes with me. Another major thrill and victory: wearing jeans for the first time in more than 20 years. For two decades it was nothing but black stretch leggings. That’s every single day – even in heatwaves! Another big victory is, food no longer runs my life. I often leave unfinished bites or portions on my plate because it no longer has an hypnotic allure over me. I know now when my body’s had enough. I’ve learned how to nurture myself emotionally, so food is no longer misused. Oh yes, and I look and feel better at age 50 than I did in my 20’s! In my old life, I ate strictly according to what my taste buds demanded. I wanted pleasure, pleasure, pleasure! And I didn’t care about nutrition. I’ve come to realize pleasure is still very important and is inexorably tied to food and the experience of eating, but eating can’t be strictly about pleasure, it has to be about nourishing the body as well as the psyche. Before I’d eat lots of simple carbs such as breads, cookies, sugared cereals. Now I eat hot cereals made of whole grain, homemade soups with lots of vegetables, and pan-seared salmon with a side of cauliflower hash (I eat vegetables, but I’ve got to keep them interesting!). Believe it or not, I went to a gym when I weighed 300 pounds +. But my eating was so out of control it didn’t put a dent in my weight. It was only when I took a look at my life and dealt with issues that were causing me to drug myself with food that the weight began coming off. Now I do lots of DDPYOGA, long-distance walking, and light weight lifting. And I eat clean, which makes all the difference. In general, I love movement whereas before, it was a chore. That’s the biggest reward – everything is easier to do at this size! Listen to your body – it’s your best friend – and also, it’s a whole lot more intelligent than you give it credit for. It will tell you what foods it’s craving and when you have had enough to eat…and will also tap you on the shoulder to let you know when it’s time for more food. It may take some time, because we’ve been brainwashed by the diet industry that we can’t trust ourselves, but that’s just not true. Make friends with your kitchen. It’s a big and important part of getting the weight off and keeping it off. Cooking whole foods from scratch (or partially from scratch) is more nutritious and cost-effective than eating out or take-out. There are lots of great cookbooks and blogs out there with easy recipes. Cooking is also very theraputic. It’s one of my favorite forms of meditation. Exercise is a must. And this goes for anyone, not just those with weight issues. It’s de-aging and de-stressing. Don’t look at it as punishment. Be grateful there’s a wonderful method of losing weight, feeling stronger, warding off aging symptoms that’s free and doesn’t come in a pill bottle! Somedays I get side-tracked with excuses…I listen to them all, realize how valid some of them are and then say out loud…”OK but guess what? We’re going to work out anyway!” It’s as crucial as brushing my teeth…it’s simply a must that I don’t argue with myself over. Take Control of your liquids. It’s really important to have quality beverages in your life: water, herbal tea, fresh juices (it’s one of the best ways I get my vegetables in). I drink about 2-3 quarts of water a day. It’s cleansing for the body and good for the skin. Getting enough fluids during the weight loss phase is crucial because of all the fat that’s being processed out through the liver. There are toxins in that fat and plenty of water will be a great help to the ‘flushing’ process. Be kind to yourself. See the whole picture. You’re not just a number on the scale or the number of pounds you’ve lost (or gained) that week. Setbacks and moments of weaknesses are part of life. Don’t be hard on yourself when they come. Perfection isn’t the goal. I have times when I overeat or don’t make the best choices, but I don’t let those moments define me. I simply recommit to a healthy way of eating and remember what I want: to be happy and healthy inside and out…and to keep wearing my size 8 jeans! Lydia Simpson I was thinking the same! wonderful gadget, where did you find this? I absolutely love her mindset and attitude! Love the real ness of this article and making it seem possible! How did you get rid of the extra skin from losing that much weight? I’ve lost about 125lbs and have an apron of skin on my abdomen want to get rid of it but can’t afford skin removal surgery . Its frustrating to workout so hard and keep up the fight when I see it in the mirror every day. Inspiring! Def looking into the yoga! Now thats what I needed! An older success story!! 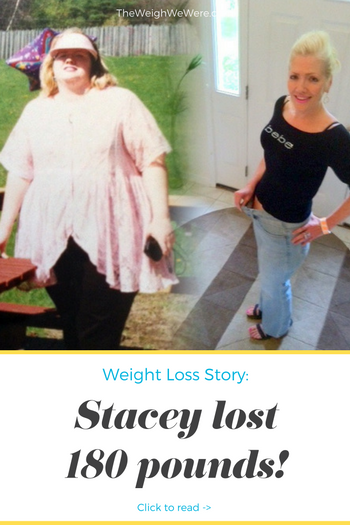 Stacey, you are such an inspiration! You look exceptional and healthy congradulations!!! Any suggestions for staying warm? I think my favorite part is at the end when she wants to keep wearing her size 8 jeans. NOT EVERYONE SHOULD TRY TO BE A SIZE ZERO!!! Love where she recognized the liver needing to be flushed!!! Having lupus and problems with it, its so important to drink plenty of water! I found nutrition is the main key and definitely a work out program too. I try not to focus on the scale too much because I lost only 10 lbs but 17 inches. Stacey you are an inspiration to others. way to GO!!! I’m revving up my efforts! Tanya how did u lose it!?!? 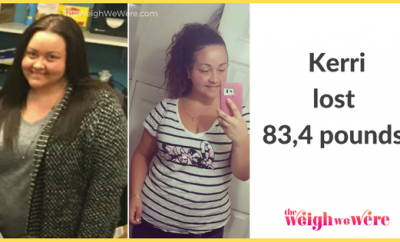 I’ve lost 187… In 7 lbs I have lost half my weight. I still have 40 to go! Bailey May. Some good tips. Especially about why we need to drink a lot of water. Wow you are sooo BRAVE AND AMAZING!!! Such a inspiration! Absolutely amazing! You look awesome!!! I have that problem with food, it is my comfort. I lost 40 lbs last year and have gained back more than half! I just need to say no to junk all the time and yes to exercise and eating better! Outstanding achievement and great reporting! For anyone who thinks there’s a catch, well of course there is. Determination and education coupled with consistent follow through. wish I could add more likes to this! 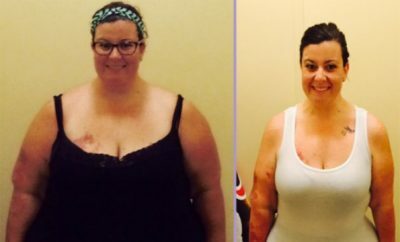 awesome for her to get healthy! wtg that’s a big accomplishment! congrats ! your story was just what I needed ! thanks for paying it forward ! All I can say is wow!!! 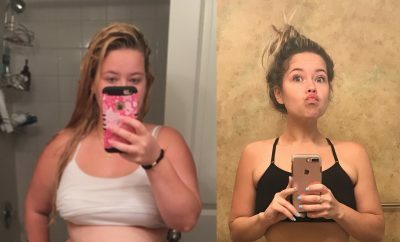 What an incredible transformation! Do you girl! Kelly Porter how can you not tell the age in the pictures? There’s no catch. eating healthy a catch? yep…sure is…you catch it and change your life for the better. what?? more like the pic in the black was before pic, then the other is the new pic. there’s always a catch to this. Have you had surgery for loose skin??? ?